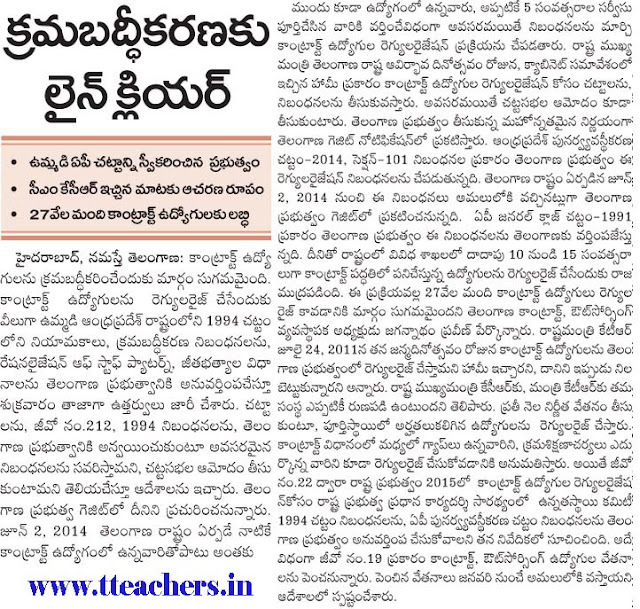 TS Contract Employees Rationalization Notification Go 16 Telangana: Acts- The Andhra Pradesh Re organisation Act, 2014 - The Andhra Pradesh Public Employment (Regulation of Appointments to Public Services and Rationalization of Staff Pattern and Pay Structure) Act, 1994 (Act 2 of 1994) - Adaptation to the State of Telangana - Notification - Orders - Issued. 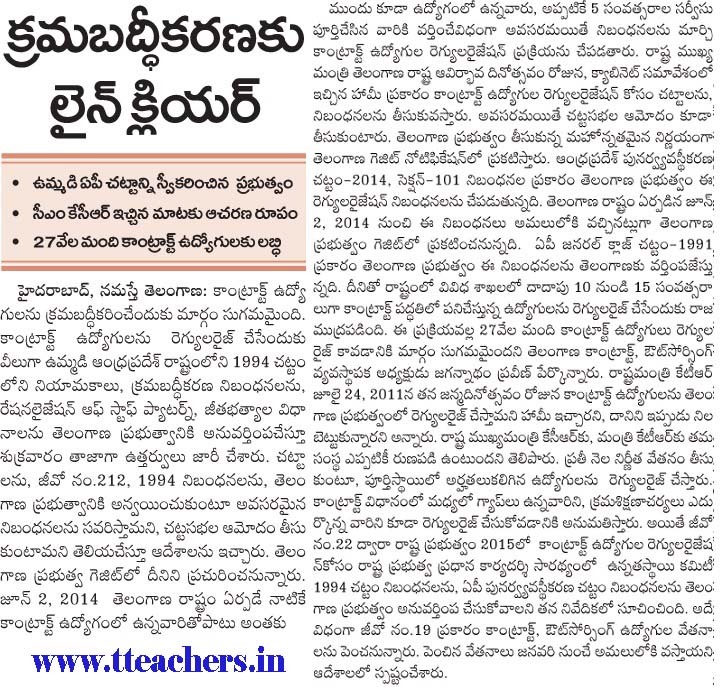 And whereas it has become necessary to adapt the Andhra Pradesh Public Employment (Regulation of Appointments to Public Services and Rationalisation of Staff Pattern and Pay Structure) Act, 1994 (Act 2 of 1994) which was in force in the State of Andhra Pradesh as on 01.6.2014, with certain modifications / amendments for the purpose of facilitating its application in relation to the State of Telangana. Accordingly, the following Notification will be published in an issue of the Telangana State Gazette. Regularization may be considered only in respect of eligible personnel working as on 2nd June, 2014, immediately before formation of Telangana State, and continuing till the date of proposed regularization. The backlog in reservations if any arising out of regularization as above shall be carried forward and treated as backlog vacancies for that particular category".